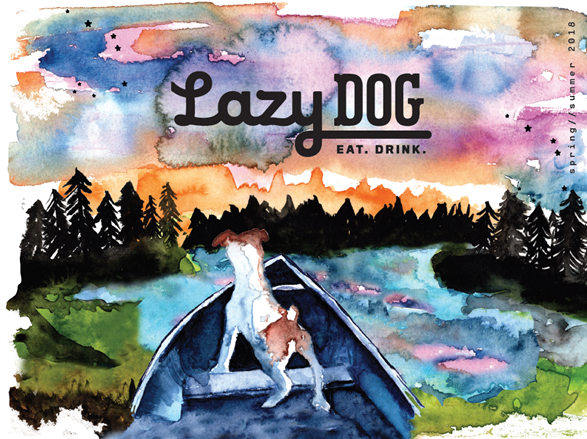 New Spring Menu at Lazy Dog Restaurant! Spring is here and so is Lazy Dog Restaurant’s new Spring menu! The laid back lodge inspired restaurant has introduced a new, seasonally inspired and handcrafted menu that is infused with a variety of fresh and inspired ingredients. 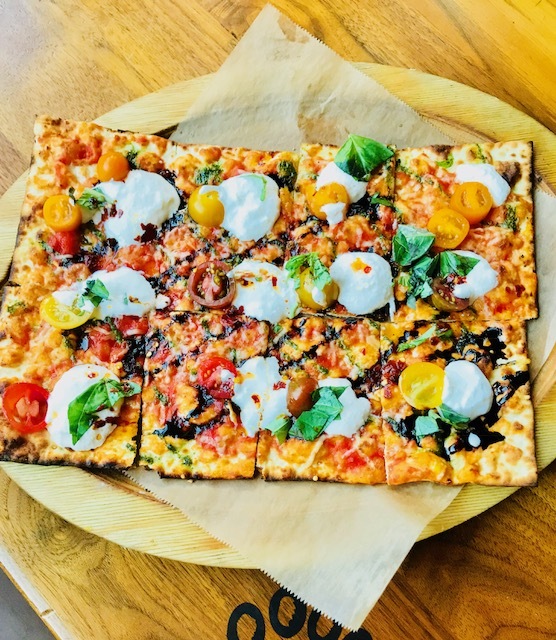 Lazy Dog’s co-founder Gabe Caliendo, has created a new menu that offers something for everyone and will satisfy foodies everywhere. He has hand crafted several very unique and flavorful dishes that will delight you with its freshness and authenticity. The menu includes 11 new menu items and five new beverages including some meatless, vegan, or gluten free options. 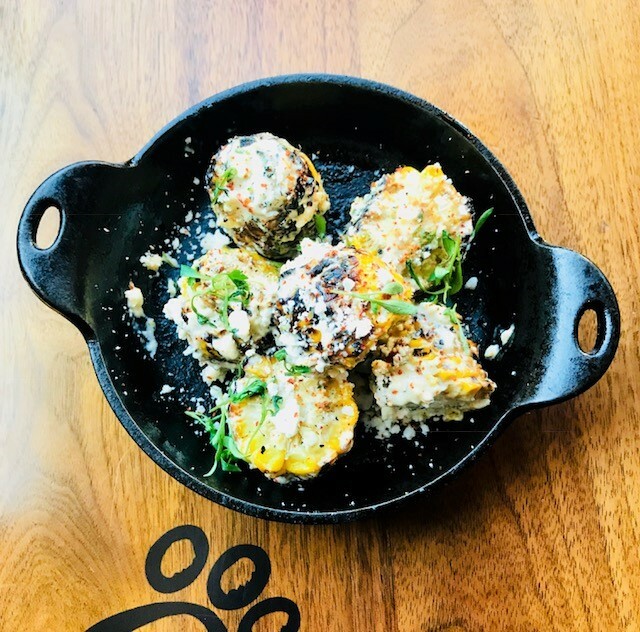 Street Corn Wheels – A twist on street corn which includes fresh corn, char grilled with lime, garlic, queso blanco, cilantro and Tajin. These are very tasty and invoke summer memories of corn on the backyard gill. 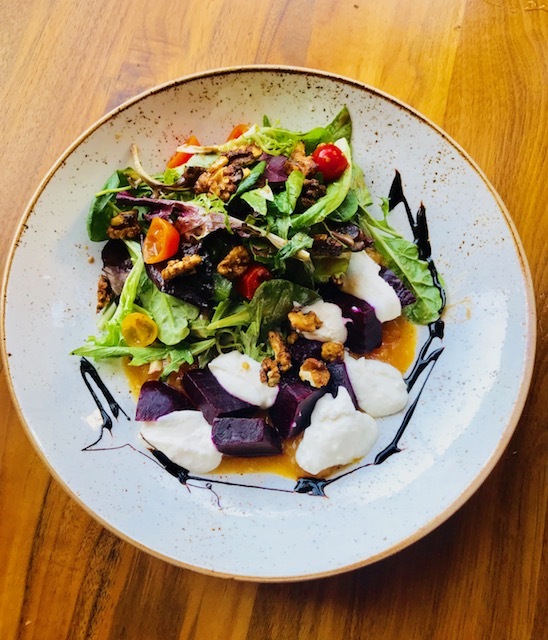 Burrata + Roasted Beet Salad – Bright field greens, creamy burrata cheese, candied walnuts, heirloom tomatoes, crushed sweet peaches, and sea salt. The freshness and sweetness that fills this salad will be calling me back to Lazy Dog. Burrata + Heirloom Tomato Crisp – Pomodoro sauce, pesto, creamy burrata cheese, parmesan, romano, balsamic reduction, chili oil, fresh basil. Loved the combination of the pesto and Pomodoro sauce and the crust was crispy and flavorful. Housemade Veggie Burger Bowl – Tasty grilled salmon, served with housemade aioli, fresh tomato, a peanut sesame slaw, red onions, on a brioche-style bun. I’d never heard of a veggie burger bowl before but this is good stuff people!! 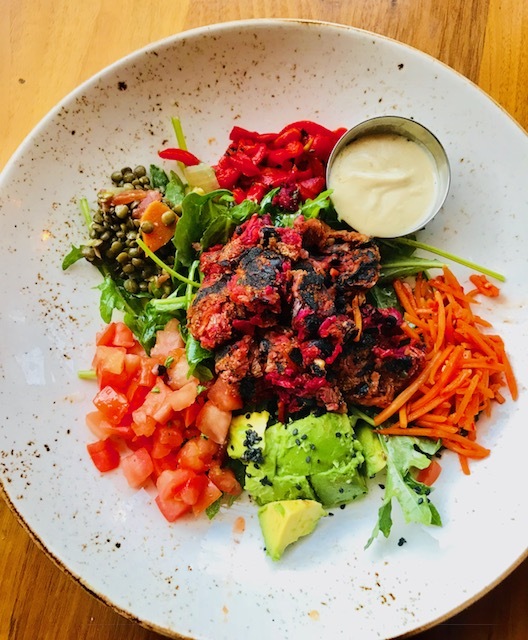 Housemade BBQ Veggie Burger – A mouth-watering meatless option – made from scratch patty with black beans, ancient grains, beets and vegetables, topped with roasted garlic, housemade BBQ sauce, jack cheese, fried onions, pickle, and tomato. I thought it was delicious and my meat loving husband said he would never have guessed it wasn’t meat – high praise! 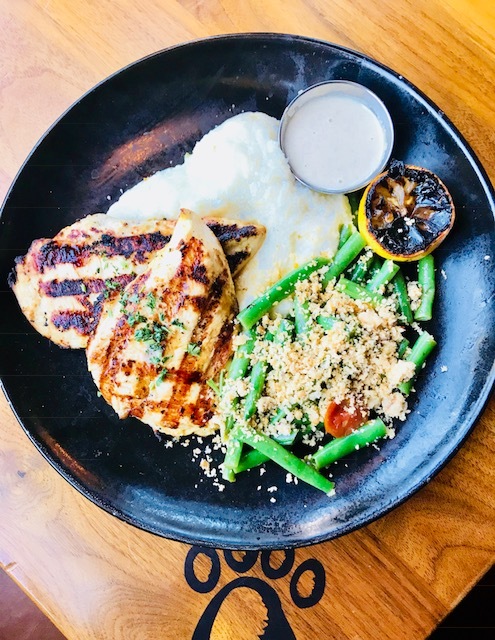 Grilled Lemon Chicken – Marinated and grilled chicken breast, cauliflower mash, sautéed green beans, and heirloom tomatoes with almond walnut crumble, and tahini. I love everything included in this dish so this is a perfect choice for me. The chicken was tasty and the cauliflower mash tasted just like mashed potatoes. Mix in all the other fresh ingredients and this is a healthy food option. 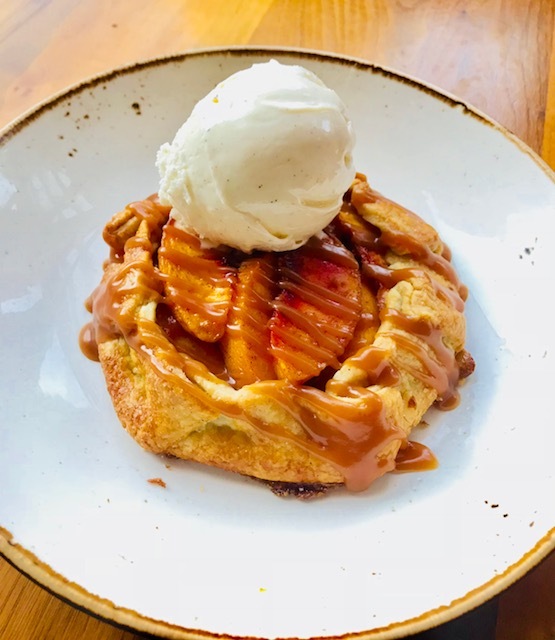 Peach Raspberry Hand Pie –Made from scratch raspberry puree, sweet peaches, cinnamon and sugar, salted caramel sauce, served warm with a scoop of vanilla bean ice cream. There’s nothing here not to like. 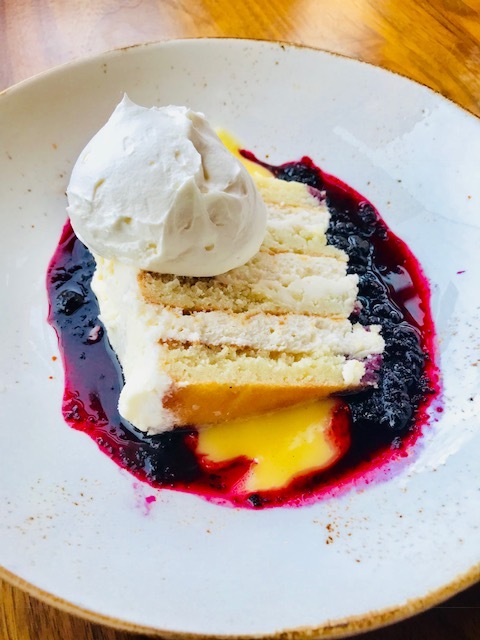 Triple Layer Lemon Cake – For those who are gluten sensitive – lemon buttercream, almond flour vanilla cake, huckleberry sauce, lemon curd, and housemade whipped cream. Light and delicious! New Libations from the Bar Menu: They’re all unique, fresh AND delicious! 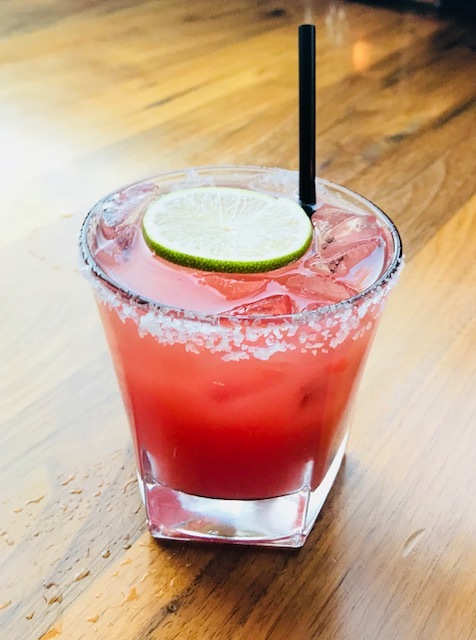 Watermelon Margarita – Made with lunazul resposado tequila, watermelon, salted rim. A perfect summer drink! Honey Thyme Old Fashioned – Made with Buffalo Trace bourbon, Cointreau, Amaro Montenegro, honey, fresh thyme, garnished with an orange peel. Tincup Whiskey Sour – Made with Tincup Mountain whiskey, housemade sweet and sour, yuzu bitters, fresh rosemary, and meyer lemon foam. Huckberry Mule – made with born and bred American craft vodka, Acacia rose, grapefruit juice, cranberry juice, sugar cane, St. Germaine, and elderflower foam. Non-alcoholic, lower calorie options are also available such as Ginger-Lime Sparkling Soda and Tropical-Orange Sparkling Soda. While Lazy Dog’s founder Chris Simms was growing up, he and his family would vacation in the breathtaking Rocky Mountains of Jackson Hole, Wyoming. Whether it was skiing in the winter or fishing in the summer, Chris will tell you that even today it is the place he goes when he wants to get away and relax. 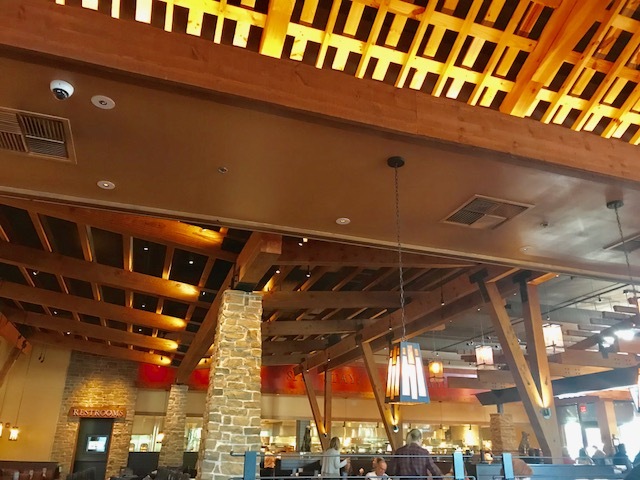 When you are in any one of the Lazy Dog restaurants, you will see how Chris has tried to capture and recreate the feeling he gets when in Jackson Hole. He wants you to feel like you are walking into a place that is the perfect balance of warm and comfortable, yet full of excitement and positive energy. 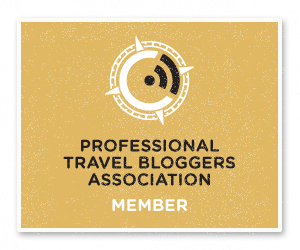 For Chris, the lodge represents vacations with family and friends. Where did the Lazy Dog get its unique name? One snowy afternoon, walking back into the lodge after a long morning on the slopes, Chris noticed a dog lying by the toasty fireplace. Commenting to his buddies on how much he loved his time hanging out there, he told them he wished everyone could enjoy life as much as that “lazy dog’ by the fire and a concept was born! 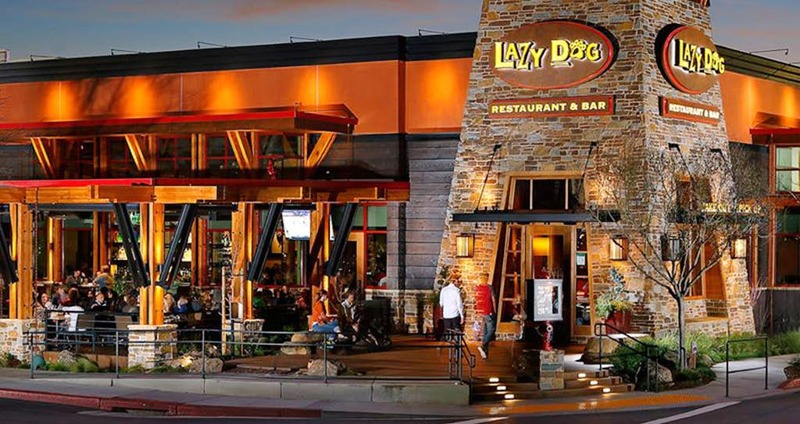 Something that’s not changed is the warm, cozy, and rustic setting and the friendly service that we’ve always gotten at Lazy Dog. And don’t forget about the awesome dog friendly patio (they have a dog menu too) and the best fire pit in town. 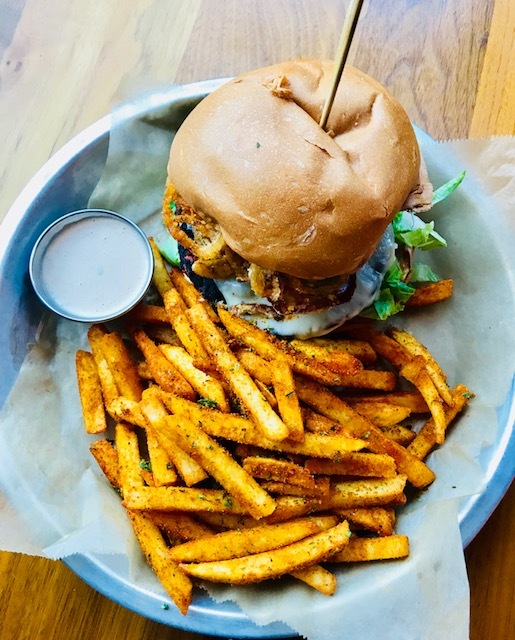 Even if the weather hasn’t quite settled into spring (in Texas at least) Lazy Dog’s new spring menu will put you in the mood for longer and lazier warm summer days filled with fresh and homemade food just like your mother made but much much better!